Complete with height adjustable shelf and lockable drawer. Drop tested from 9.1 meters, automatic slam shut locking and supplied with internal key hooks. 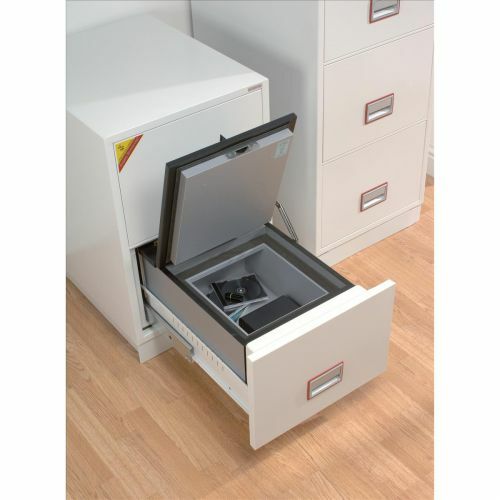 FOUR SAFES IN ONE This safe provides fire protection for paper documents, computer diskettes, tapes and all forms of data storage and security for cash and valuables all in one unit. Suitable for use in residential or business premises. Fire Protection for Paper: Tested to Swedish NT Fire 017 – 90 Paper. Providing 90 minutes fire protection for paper documents. Fitted with an advanced high security electronic lock with clear LED display with internal alarm, dual control, hidden code, scrambled code and time delay that can be programmed as standard. Recommended for an overnight cash risk of £2,500.00 or £25,000.00 valuables.